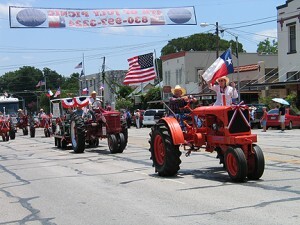 The annual Fourth of July Parade began in 1991 by a group of community volunteers and continues to be held every year on July Fourth. Plan now to come and enjoy the fun! The parade is scheduled to begin at 10 am on Tuesday, July 4th. Arrive early for a good spot! Immediately following the parade, usually about 11:30, there is a free patriotic program on the Marktplatz in downtown Fredericksburg. You’ll hear patriotic messages, live performances and more. We hope to see you there. Interesting in helping out? This event has been sponsored by volunteers for the past quarter century and is meant to be a celebration of our pride in our country and our independence. The City of Fredericksburg is a partner in helping the committee bring this fun event to our friends and guests, but we could always use more help! If you are interested in participating in the parade, please contact the committee at [email protected] for an entry form or click here to learn more. This entry was posted on Saturday, June 10th, 2017 at 1:41 pm	and is filed under Events, News & Updates. You can follow any responses to this entry through the RSS 2.0 feed. Both comments and pings are currently closed.